Today is a good Friday. Today is Good Friday. 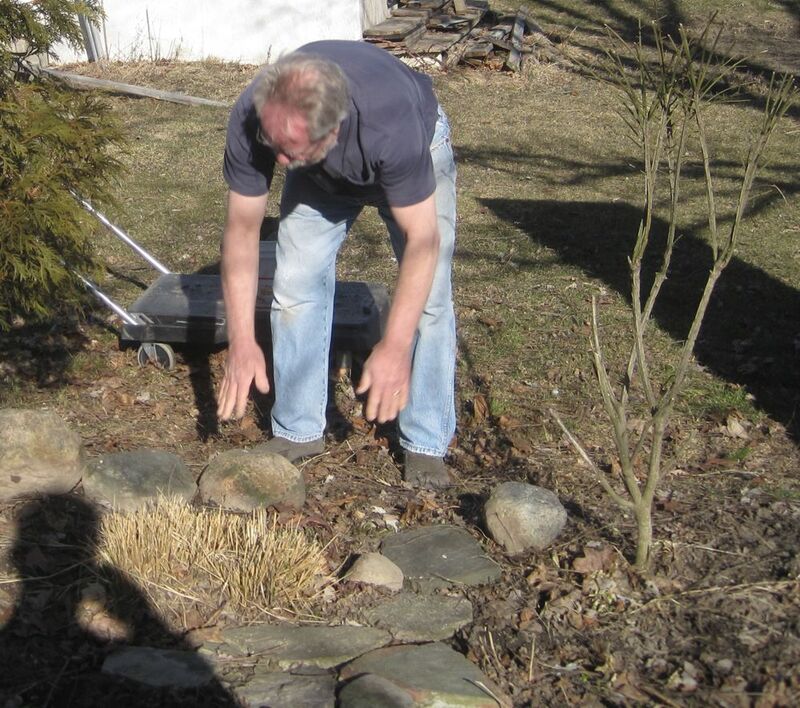 I didn’t wake up this morning knowing that I was going to deconstruct my little backyard labyrinth on this sunny day. It came about during a leisurely conversation with my husband after attending the morning Good Friday service at our church and eating lunch on our back deck on this first warm day of spring. We were getting ready to do some yard work and he nonchalantly said, “I have a suggestion for you, take it for what it’s worth. I think it’s time to decommission the labyrinth.” Sitting there looking at our forlorn little labyrinth in its sorry looking pre-daffodil state, my heart smiled and said “Yes”. There was no struggle. 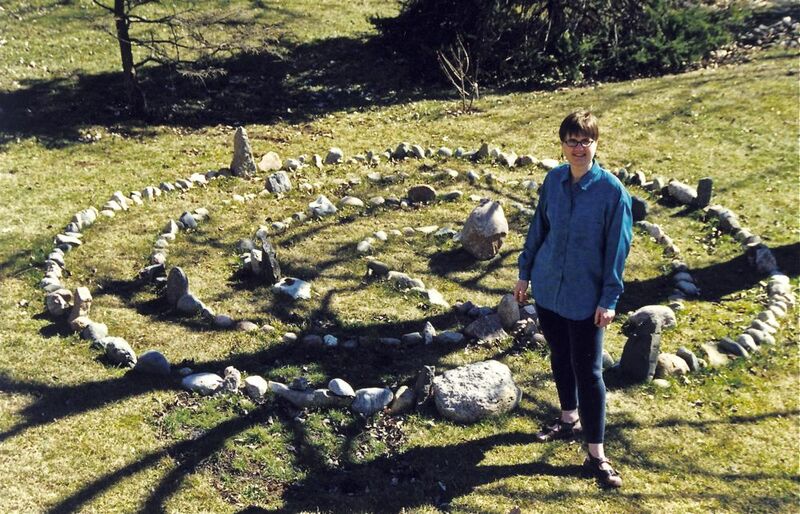 Thirteen years ago I laid a 15 foot diameter labyrinth in my backyard. Back in the mid 1990’s “the labyrinth” had nestled its way into my spiritual walk and I had embraced it as a meditative tool with great fervour and gratitude. 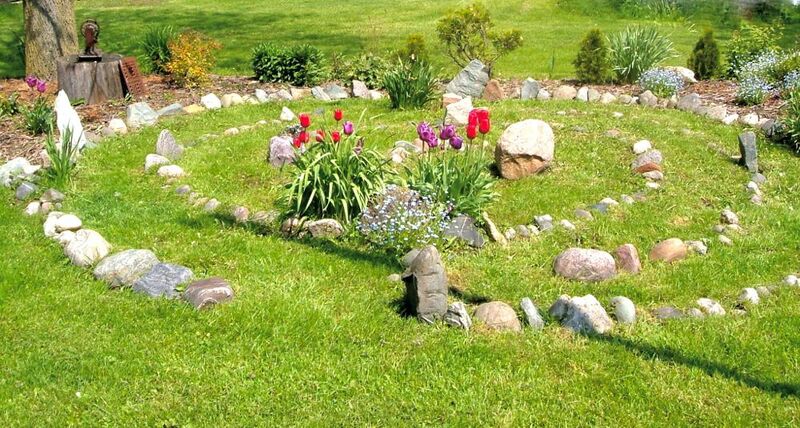 I designed and built huge labyrinths at retreat centres and smaller backyard ones for friends. Dr. Lauren Artress’ book Walking A Sacred Path: Rediscovering the Labyrinth as Spiritual Tool equipped and empowered me to facilitate many labyrinth walks for others. For my own labyrinth I had gathered the stones from all over. The centre stone I brought back as a ‘seed’ from my favourite retreat centre in the Catskill mountains. 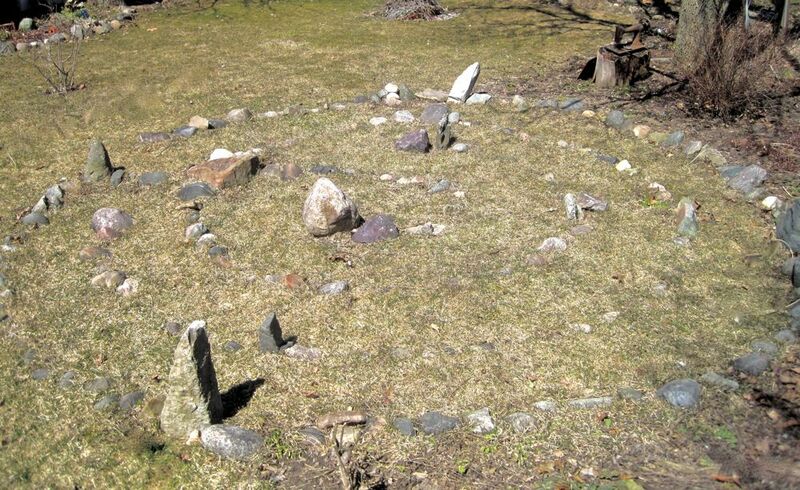 On a full moon in May 2000 I measured out the circle in my backyard and laid the stones by myself in a three circuit cretan labyrinth. 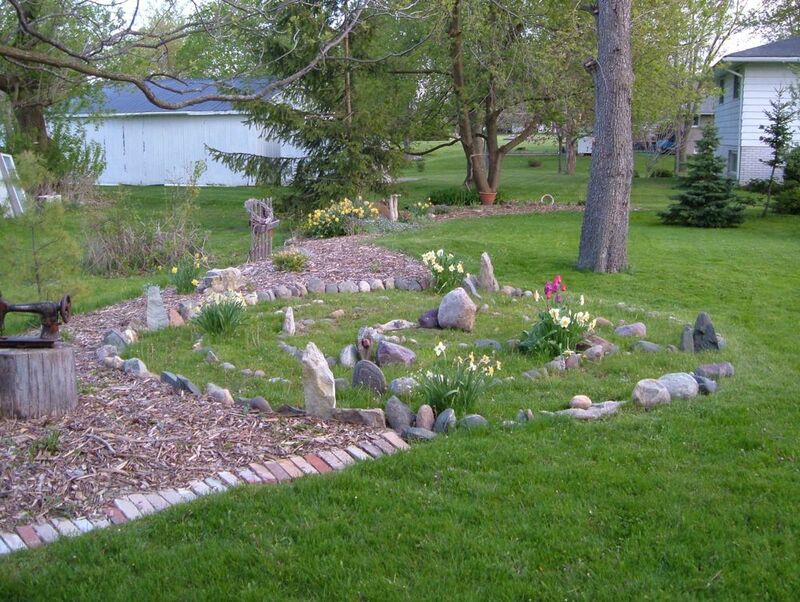 Over the years I have collected many more stones from far away and they have found their place in this sacred circle. A walking labyrinth, such as this, is the perfect personal meditation tool. It brought us meaning and joy. I walked it in the morning and prayed facing each direction. In the winter she poked out through the snow telling her story with her little upright standing stones. I had planted her up with many daffodils and tulips so in the spring she bloomed her little heart out. The stewardship of it had been waning however. To own a labyrinth one must be a good steward. Some of the stones had actually sunk into total disappearance, like the ground had eaten them. I thought about how the ancient European standing stone circles had withstood millennia. My labyrinth required more care than we could now give it. It was ceasing to be a nurturing space. Today seemed as good a day as any other to put our hands to the task. Before the daffodils appeared. When my husband took this photo I realized that I had inadvertently worn an old sweatshirt bearing the labyrinth logo! He partnered with me, as he has done in the past whipper-snipping the labyrinth in the summer. I honestly don’t know where we got the energy. 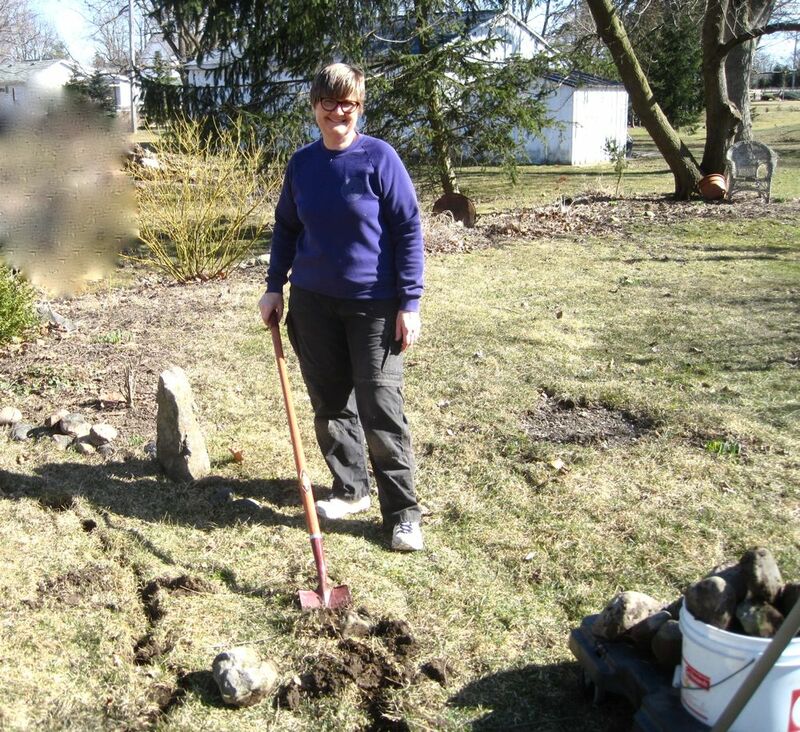 We made short work of the rock removal, piling them behind our pond. Some larger stones took more prestigious spots in our front garden and some of the prettier ones will find a new home in my daughter’s new backyard. When all the stones had been moved we walked it just one more time, with all the holes in the ground. Sort of felt like having your wisdom teeth removed. As a contemplative musician it was the perfect opportunity to close the day with a ritual song for this decommissioning. Accompanied by my Remo buffalo drum, and much street noise, I sang a little intuitive melody. It’s certainly not the best video but it’s my way of giving thanks. I laid the stones on a full moon and today was a full moon. It didn’t go unnoticed to us that this was Good Friday. The significance of that is still permeating. Sort of a ritual death, a releasing of something, a burial. A simplifying. This entry was posted in Music, Spirituality and tagged labyrinth, Spring on March 30, 2013 by nurturingspace. Definitely a fitting activity for a Good Friday in all senses. Clearing a space for new spiritual paths is brave and demanding work. Hang in with the empty space as new forms take their own time to fruit. (That’s fru-it, the verb of fruition!!) Love the finger piano gratitude piece. Very meditative.